The Guardian newspaper this week reveals that China has committed $75bn (£48bn) on aid and development projects in Africa in the past decade. US researcher group, AidData, launched the largest public database of Chinese development finance in Africa, detailing almost 1,700 projects in 50 countries between 2000 and 2011. The data, which challenges what has for years been the dominant story – Beijing’s unrelenting quest for natural resources – is likely to fuel ongoing debate over China’s motives in Africa. Whatever the motive behind, China is still playing an important role in closing funding gaps in Africa. For the purpose of this article, we will focus on part of the database that shows the Chinese government’s aid and development projects towards Eritrea in the past decade. 1) 200,000 lines fixed telecom network rehabilitation project $30.8m In 2005, ZTE agreed to a 200,000 line fixed telecom network rehabilitation project for 18 months. The project cost $21.45 million and was funded by the Export-Import Bank of China. The scope of the project includes PSTN fixed network switching equipment, CDMA wireless equipment, intelligent network, voice mailboxes, client service center, router, ADSL and others. The status of the project is uncertain. 2) Interest-free loan for hospital $17.0m On May 31, 2003, Chinese ambassador Chen Zhanfu handed the keys to the Orotta hospital over to President Isayas Afewerki at inauguration ceremony in Asmara. The ceremony was attended by Saleh Meky, the Eritrean Minister of Health. At 200-beds and covering 10,000 sq metres, the fully-equipped Orotta hospital is the largest in Eritrea. It was funded by a $10,000,000 interest-free loan. 3) $3m Grant (needs to be double-checked; might be duplicate) $5.0m On June 15, 2003, Eritrean Economic Advisor Woldai Futur and China’s Vice Minister for Foreign Trade and Economic Cooperation Zhou Keren signed an agreement for a $3m grant. 4) $3m Debt Cancellation $5.0m On June 15, 2003, Eritrean Economic Advisor Woldai Futur and China’s Vice Minister for Foreign Trade and Economic Cooperation Zhou Keren signed a $3m debt cancellation agreement. This relieved Eritrea’s obligation to repay a soft loan received in 1994 for agricultural machinery. 5) $2.4m Grant $4.0m On January 9, 2002, Eritrean Foreign Affairs Minister Ali Sayyid Abdallah and Chinese Foreign Minister Tang Jiaxuan signed a $2.4 million grant for economic and technical projects. 6) $2m aid $3.2m On May 6, 2003, Eritrean Economic Advisor Dr. Woldai Futur and Chinese Ambassador to Eritrea Chen Zhanfu signed a $2 million aid agreement for use in economic and technical sectors. 9) 1.8m dollars development agreement $2.7m On June 1, 2004, Eritrean Foreign Minister Ali Sayyid Abdallah and Chinese Foreign Minister Li Zhaoxing held talks in China on bilateral and international issues, culminating in a CNY 15M development assistance agreement. 10) $23m loan for telecommunications development $31.0m In Asmara on April 11, 2006, Eritrean National Development Minister Woldai Futur and China’s ambassador to Eritrea Ju Zian signed a $23 million preferential loan agreement funded by the Export-Import Bank of China to build infrastructure for fixed and mobile telephones. The project is expected to take 1.5 years. The project will improve Eritrea’s current communication network, establish fixed telephone network coverage in major cities, extend CDMA basic wireless coverage for the entire country, including islands, and increase the telecommunications usage density from the current 1.5% to 6.5%. 11) Electronic media equipment — In October 2006, the Chinese Embassy to Eritrea extended different electronic media equipment to the Eritrean Ministry of Information. Mr. Asmelash Abraha, Director General of TV in the Ministry, said the equipment would help in the day-to-day activities of the Ministry. 12) Gedem Cement Factory $107.7m On August 15, 2006, President Isayas Afewerki held talks with a Chinese delegation from the Export-Import Bank of China headed by VP Zhu Hongjie. The Chinese delegation was expected to observe the site and conduct a study on ways of extending a loan for the establishment of a cement factory in Gedem, Eritrea. The $80 million cement factory was completed in 2011, financed by Chinese preferential loans. 13) Donation of de-mining equipment — The Chinese government and the Mine Action Service of the United Nations Department of Peacekeeping Operations are co-sponsoring another training workshop on de-mining technology from May to June 2000, with trainees from Angola, Ethiopia, Mozambique, and Rwanda. 14) College of Arts and Social Science Expansion — On July 24, 2007, Eritrea announced that it had signed two economic agreements with China on expanding the Red Sea state’s universities and unspecified technical cooperation. The agreements included programs to expand the College of Arts and Social Science currently under construction in Adi-Keyih. The College was inaugurated on June 11, 2010. 16) 500 million yuan ($67.36 million) soft loan $78.4m In 2006, China Import-Export Bank signed a CNY 500 million soft loan with Eritrea. The status of the loan is uncertain. 17) Chinese Medical Team Provides Health Service in Awgaro — In 2008, an eight-member Chinese medical team provided health services in Awgaro. The head of the Awgaro health center, Mr Girmai Measho, stated that the Chinese doctors gave efficient medical treatment to patients from different areas of Laelai-Gash sub-zone. 18) $6m loan, cooperation agreement $5.6m On September 4, 2010, Eritrea and China concluded a $6 million interest-free loan agreement. The loan was planned for Eritrea’s food security development. Mr Berhane Abrehe, minister of finance, signed the agreement on the Eritrean government side, and deputy foreign minister, Zhai Jun, on the side of the government of the PRC.The status of the loan is uncertain. 19) Mine-Sweeping Equipment and Training — On November 12, 2001, China donated mine-sweeping equipment to Eritrea. Chinese Ambassador to Eritrea Chen Zhanfu, Eritrean officials and Chinese military experts were present at the ceremony. Officials from the Chinese embassy said that Chinese military experts will conduct personnel training for Eritrea and go on a fact-finding mission to learn about landmine conditions in the country. The status of the equipment is uncertain. STAFF_NOTES: Projects involving military contribution for a humanitarian purpose such as de-mining equipment have been categorized as ODA-like. This is part of the Peacekeeping section of the OECD categorization. Other military contributions of development and humanitarian assistance will be similarly categorized as ODA-like. 20) Training for new leather technology — In June 2008, the Chinese government paid for the students from 36 countries, including Kenya, to come to Beijing to learn how to turn cattle hides into finished leather using the latest technology. The countries participating include Tanzania, Eritrea, Ethiopia, Zimbabwe, Zambia, Sierra Leone, Nigeria and more from South America and Asia. China’s Ministry of Commerce funded students’ flights, accommodation, month-long training course and visits to local tanneries. The training was going to go for one month. The amount is unknown. 21) Educational and Medical Services — In 2007, Chinese Vice-Premier Wu Yi called on a group of 100 Africa-bound experts and volunteers to provide good service to their African hosts. 26 volunteers were sent to work in education and medical services in Mauritius, Tunisia, and Eritrea.The status of the workers is uncertain. STAFF_NOTES: This project was left ODA-like since the Vice-Premier made an announcement for the volunteers. There is no information on which organization or government sponsored the volunteer program, but the government’s approval of it creates a logical argument for ODA-like. Loan is not aid. You have to pay loans back, unlike aid, which is free with political and economic favors. Please change the title bro, I don't want people thinking China is aiding Eritrea like some beggars in our region. Aid is to provide support of any kind. Therefore loan is one type of Aid, when you are in need it is not only a grant that is defined as aid but any soft loan including free interest or long term loan is defined Aid in political-economic terms. It is not begging or defame to get a loan, that is actually a way to development if used wisely in zero corruption management system. Contemporary Developed nations like Japan, South Korea, even Germany have passed through loans after WWII. and accept the truth without unnecessary arrogance. We are a new nation in-construction with many barriers and obstacles. fell in any trap of west or east. I agree with you Sammy! Begging which is an endemic in our neighbors in the south, should not be confused with trade partnership that includes loans and other bilateral co-operations. There is nothing to mislead here. Check the above facts first. 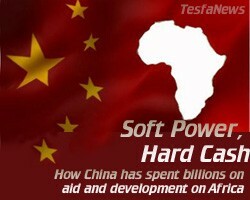 Chinese development aid to Eritrea are either in the form of loans or grants. All are collectively called assistance (Aid). There is a difference between between aid and loans. Your "beggar" neighbours are educating and feeding your "educated" and "rich" citizens. Shame and awe!! Retardedl Jacob, our “beggar” neighbors cannot even feed their own citizens except ethnically cleansing Ethiopian citizens. If these beggars appeared “educating and feeding” our “educated” and “rich” citizens, because they were hired and paid to destabilize our nation, when everything else has failed, be it militarily, legally or even diplomatically. The relation with China and also the developmental loan is, as Eritrea justifiably declared it, non-interference partnership. Swallow the bitter pill of Eritrea’s slowly but surely development that is growing by the day, no matter who is betraying, sabotaging the youth, or even sanctioning illegally and unfairly while appeasing belligerant Ethiopia. But remember, it didn’t mean China didn’t have its own strategic interest in Africa. There is no “free lunch” here. Long live Shaebia! Jacob: beggar is beggar ” Loan is a Loan not Aid. ” Go home and feed your own people. All Eritreans live in Ethiopia feed their own selves using money which they get from their own family member live in the US or Europe. Go check statistics of Ethiopian banks in Tigray, they are number one in foreign exchange out of all Ethiopian branch banks, because of the Eritreans who are hostage in refugee camps in tigray. Your idiot self can’t even feed yourself let alone feeding the pride people of Eritrea. I have no problem with loans and grants as long as they are used properly and efficiently to improve the economy. Then, the loans should be paid so we are not indebted to any country. It is now time to start up businesses and give job opportunities to the people. Exports and imports should increase and these loans/grants should help with the infrastructure for that. With an increasing economy, we should have more money to spend for things like education and healthcare. We're doing well with the Millennium Development Goals (MDGs), but if anyone's noticed, we're not set to achieve the first one. The amount of people living off less than a dollar and twenty-five cents a day needs to be halved. Time for an economic change! the chinese are just doing what works for them in the long run. we have the port, and they wanna use it, as it is VERY COSTY to them to air lift everything from ethiopia, s.sudan and even n.sudan to an extent. they just want to use all 3 ports p.sudan, p.massawa and ofcourse assab. and i don blame one bit. the ever overcrowded ' port DJ BOOTH ' is just not cutting it for the U.S the chinese. yes the highest number of people in the world is friend of Eritrea. yes China, of course Las Vegas. God bless Las Eritrea. What is behind China motive in Africa? For so long as anyone care to remebmer, by virtue of its monopoly in the field of science and techonlogy, the West has been able to make Africa dependent to its spher of influences. Meaning, using its 'knowhow' as leverage, they have been reigning supreme and unchallenged in the continent of Africa looting, stealing, and plundering to their heart content, while Africa and African's were bleeding to death. Now the monoploy has been blown apart thanks to the advancment of China, Africa is no longer held hostage to the west for its science and techonolgy needs. What is more, as illustrated above the chinese are much more 'friendly to do business with. Given this scenario, Africa is increasingly turning her back on the West in favour of the East (China). Of course the US and its allies are not happy with this development, so much so it is resorting to an immoral and underhanded way to maintain their grip and influence on Africa. Now, to answer the question, what is China's motive in Africa? To me it is nothing more than pure business. It has goods and services to export/sell and it see's Africa as a potential and valuable client. What happen to self reliance? As an eritrean citizen i have concern dont u guys think we need reform? I agree with u bro.we desperately need reform. Once and for good. Aid, Financial Assistance or Loan from whichever side, I would read very carefully between-the-lines the printed Terms & Conditions.